My mom gave me the most awesome card for my birthday! You know the kind that makes you cry while you are reading it?! I was inspired to create this LO based on the words from that card as I played along with this weeks mixer at Mix It Up! If you like the little birdie, check out Magistical Memories! They are having a 25% off sale on orders of $25 or more! Let your mind wander amoung the stars. but it’s also full of suprises. There aren’t any shortcuts to tommorrow. The kind of life you deserve." I believe we can all read these words and be touched by them; made to think about our own lives and where we are and what we are doing with them right now. 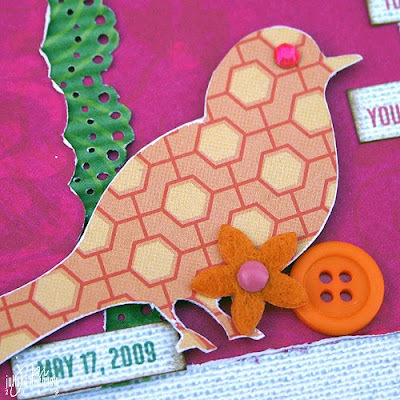 What a sweet card- I love how you inspired your layout from it!! Beautiful vivid colors! And the way you gathered the green paper trim is wonderful!! What a precious card your mom gave you, so thought provoking. I especially liked "the next rock in your path might be a stepping stone" & "and if you ever get lost, don't worry. The people who love you will find you. So sweet! PS Do enjoy the soup, so simple and yummy! Thanks for commenting!! That is beautiful, as is your layout! What a beautiful card. And a beautiful LO too. Thanks for sharing that. i loove it! that is so amazing she sent that to you, it gave me the chills. Wonderful lo. I love that card too!! 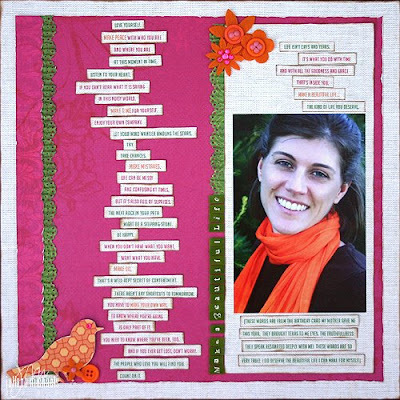 Aww, that is a gorgeous card, juliana, and the layout is gorgeous to match! I love that photo of you, too! Gorgeous work! Love the verse for the card....thats moving! I've enjoyed looking through your fabulous blog! !